Liberons steel wool is the finest on the market. Consistant quality over the years make this a very reliable product. Crumble resistant with a very low oil content, the various grades available make this a quality versatile product. Displaying 1-4 of 4 Found. 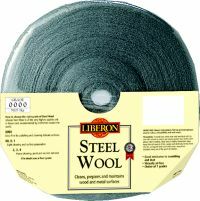 Liberons Steel Wool Extra Fine 0000 grade wire wool is the finest on the market. Consistant quality & low oil content. Medium grades 00, 0, and No.1 are used for various medium denibbing/cleaning and paint /varnish stripping operations. Grades 2, 3 and 4 designed for medium to heavy paint/varnish stripping work. These coarse grades are ideal for removing several layers of paint or varnish in conjunction with paint stripper without clogging. Liberons wire wool is the finest on the market. Consistant quality over the years make this a very reliable product. Bulk purchase, 12 x 100 gram bundles. Displaying 1-4 of 4 Matches Found.